Portugal-based Incbio secured an agreement to supply DC Biofuels with a 7.5 MMgy biodiesel plant, equipped with Incbio's ultrasonic reactors and solid catalyst acid esterification technology, to produce biodiesel from locally sourced WVO. BEI unveiled its new, fully automated, skid-mounted enzymatic biodiesel processing system. After two years of development work to hone the process and build the first unit, the firm is now working to fill orders from customers around the globe. Blue Sun Biodiesel has hired biofuels industry veteran Bruce Baughman as chief operating officer. Baughman will play a key role in identifying first-generation plants for acquisition, and integrating enzymatic process technology at its St. Joe plant. Results from the world's first flight powered by 100 percent biofuel that met petroleum fuel specifications without blending were released today by Canada's NRC. Analysis shows 50 percent reduction in aerosol emissions and better fuel economy. Specifically, Blue Sun Biodiesel is investing in a new enzymatic processing technology at its 30 MMgy biodiesel refinery in St. Joseph, Mo., which, according to the company, will reduce net production costs by more than 90 cents per gallon. U.S. Energy Initiatives Corp. has signed an LOI to form a joint venture that will provide the tools, experience and support to build several small-scale biodiesel plants in California featuring Methes Energies Canada Inc.'s Denami 600 technology. 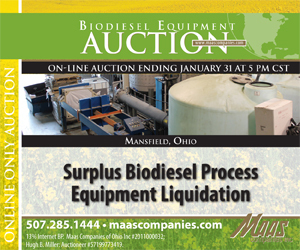 The inventory, located at 1237 West 4th Street in Mansfield, Ohio, includes a large assortment of process equipment, like-new stainless pressure vessels, tanks, chiller, lab equipment and other surplus items. It will sell in more than 40 lots. Renewable Energy Group Inc. announced Jan. 8 the promotion of Eric Bowen to the newly created position of vice president, corporate business development and legal affairs, to strengthen the company's focus on growth and diversification. 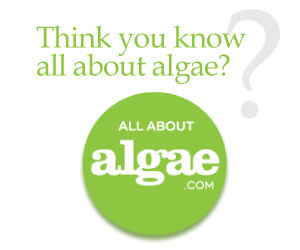 As part of the bipartisan fiscal cliff legislation passed by the House and Senate on Jan. 1, now signed by President Barack Obama, algae-derived fuels are, for the first time ever, a "qualified feedstock" under section 40 of the United States Code. EQM Technologies & Energy Inc. announced that it has entered into an agreement to sell its biodiesel production facility based in Cleburne, Texas, and related assets to Delek Renewables LLC for approximately $5.3 million in cash by Jan. 23.